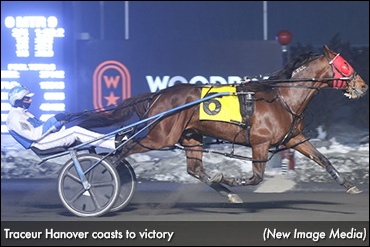 Richard Berthiaume’s Traceur Hanover ($9.30) took full advantage of a clear pocket trip en route to a two-length win in Saturday’s (Feb. 2) featured $27,000 top-level conditioned pace at Woodbine Mohawk Park. Chris Christoforou put the seven-year-old Western Ideal entire in play from race’s outset outset, and the pair led with a circuit to go before yielding to Physicallyinclined (Paul MacDonell) through a :27.1 first quarter and drafting with clearance through middle splits of :55.2 and 1:23.2. Traceur Hanover surged from the pocket with three-sixteenths to go, took the lead at the eighth pole, and edged away on his own in deep stretch to score in 1:50.4. Physicallyinclined held second, while a ground-saving Regal Son (Sylvain Filion) took third from Isitfridayyet (Doug McNair), who failed to sustain a mild bid off the home turn. Benoit Baillargeon trains 27-time winner Traceur Hanover. Christoforou and Baillargeon teamed up to capture the $22,000 sub-feature as well, as Santo and Nunzio Vena’s Rock This Way ($8.00) rallied off cover to narrowly defeat Fancourt (Randy Waples) and Torrin Hanover (Filion) in 1:51.2. To view Saturday’s harness racing results, click the following link: Saturday Results – Woodbine Mohawk Park.